With the color of the burgundy wine, this 15-year-old ripe Pu-erh offers a clean and smooth mouthfeel with a hint of Chinese herbal aftertaste. At about the fourth infusion, a sweetness emerges that gives rise to a nice finish in the throat (hou yun). 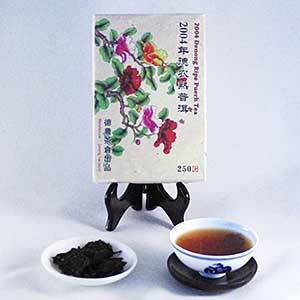 Given its current development, this tea has the potential to become an excellent ripe Pu-erh in time. Not to miss the opportunity of such good tea at an affordable price. First, a confession: I'm wary of writing too good a review and seeing the stocks of this tea disappear. Fortunately, I've already laid in some reserves. I've been buying the 2004 Large Tribute Brick steadily for about 4 years, and it has never disappointed me. This is a great value tea. At $46 for 250 grams, you are not likely to find a better price / quality relationship. No tea can be a value based on cost alone; it has to smell and taste great. And this tea does. It has an earthy aroma, like a forest after a rainstorm. The mouthfeel is full bodied and very smooth; never any bitterness or harshness. The flavor can be slightly sweet or have hints of wild mushroom, depending on how long you steep it. I take this in the car with me to drink en route to work, and often find myself commenting out loud, "D*** that's good!"